This is one of the scripts that I prepared for the “narratives” delivered at the conference called “E-Summit’19”, organized by the Indian Institute of Technology Bombay, held on January 19th & 20th. 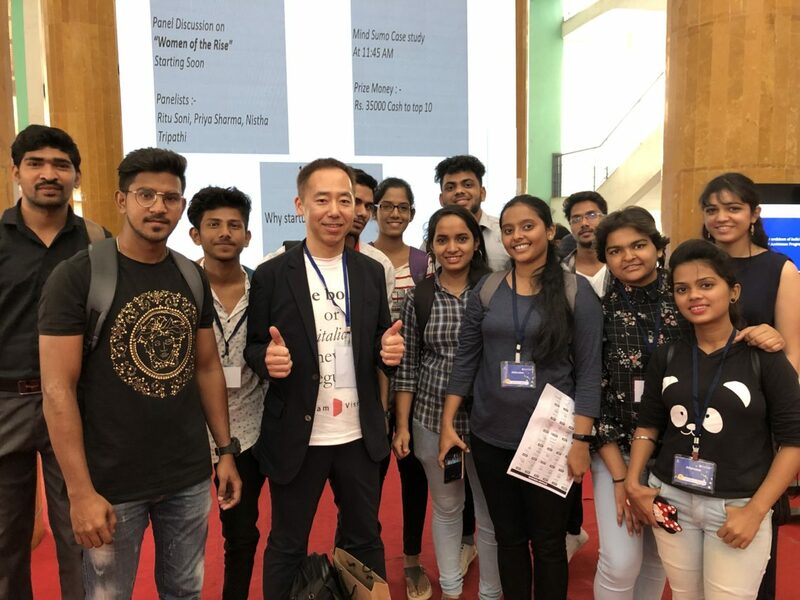 It was absolutely my first time in India and I was very honored to be invited to speak at the conference. 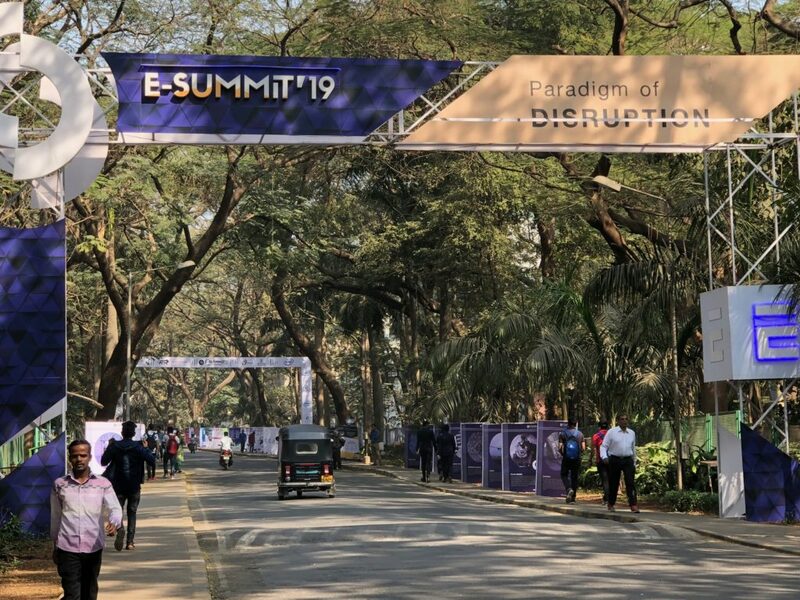 *Photo: Vedarth Choksi, a student at IIT Bombay, Head of Marketing of E-Summit’19. He is the person who invited me to speak at the conference. I did not talk as the script, but the contents of my narrative were basically as the script is. The below is the one. Hi, everyone, I’m Ikuo Hiraishi, Serial Entrepreneur and Startup Ecosystem Designer from Japan. This is absolutely my first time in India and I’m very honored to have such a speaking opportunity at this great conference. Today I’m here to share my “exit” story with you. I started my entrepreneur life back in 1991. Since then, I had 2 exits. One is the IPO of WebCrew, which I co-founded back in 1998. The other one is Interscope, which I also co-founded in 2000. It was successfully sold to Yahoo! Japan. However, I screwed up the FIRST DreamVision so beautifully. Then I was picked up by a professor and started teaching at the MBA school in Tokyo. Actually still teaching. Then I joined the company called SunBridge, and co-founded SunBridge Global Ventures as a spin-off from SunBridge. It’s a seed-early stage focused VC & accelerator. And then, I left SunBridge Global Ventures at the end of June 2017 to accomplish my “unfinished business” in my life before “the best-before-date” of my life is expired. That’s why I reactivated DreamVision right next day, on July 1st, 2017. *Three major players in the Internet Research industry in Japan in the early 2000. Today, I’m going to tell you about the EXIT story of Interscope. Interscope was one of the 3 major players in the Online Research industry in Japan. We say “Internet Research”. The other 2 players were Infoplant and Macromill. Three of us were founded and started almost the same time, but the characteristics and positioning were very different. Infoplant was founded by Masaki Otani, who used to run a TV program production and turned into Internet Research. Let me introduce why he made a pivot to Internet Research from a TV program production. I have no idea how TV & broadcasting industry is structured in India, but in Japan, it’s a typical industry of hierarchy. Meaning, Otani-san, the founder of Infoplant had been oppressed by broadcasters. For example, Otani-san was always asked by the directors of broadcasters to collect information by tomorrow morning when he was asked at 5 pm today. However, this kind of oppressed situation made him think and start “Internet Research” as a tool of “interviewing” people rather than approaching them on the street with very limited time. One day, he got a call from Microsoft Japan and was asked if Infoplant can handle marketing research. That was the trigger of the scaling of Infoplant. The survey system Infoplant developed to get out of the severe situation was not only working to replace the street interviewing, but also valuable for marketing research. The other one in the 3 major players was Macromill, co-founded by Ex-Recruit people. Recruit is a giant in the HR related industry in Japan and now expanding into the global market. The market Macromill focused on was “Advertising Agencies”. Because advertising agencies conduct marketing research quite often, especially for the competition against the other advertising agencies. Also, such opportunities are being repeated frequently. It means, Macromill did not have to pitch to lots of different companies if they have “big advertising agencies” as their clients. 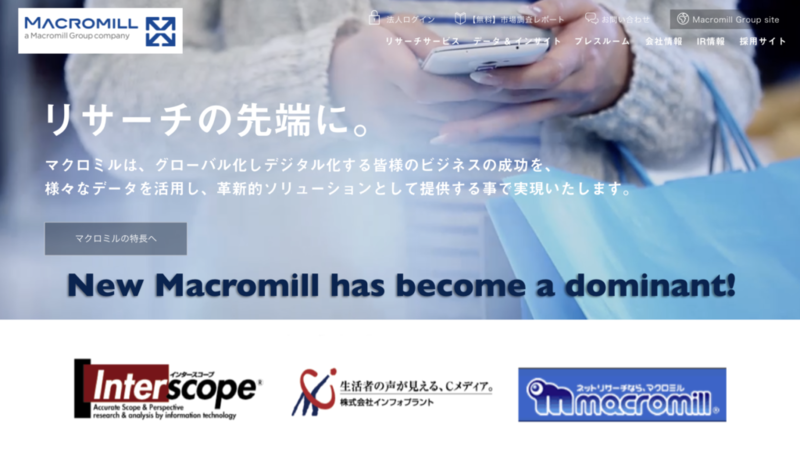 As I remember it was January 28th, 2004, Macromill went public to the emerging sector at Tokyo Stock Exchange Market, it’s called Mothers. The market cap at the opening price was about USD300M, and the peak was USD600M. Their operating profit rate was 30% and the top-line growth was almost “double” at the time. And PER was about 100! Compared to Macromill, Interscope was very behind in terms of the profit rate. It was about 10–12% from the top-line. It was not bad, but just because Macromill was excellent, we were not really attractive from the investor’s point of view. We had lots of “Unique and Innovative Technologies” originally invented by ourselves and had been recognized as the “most innovative” company in the sector. However, we were not so profitable. The other problem of Interscope was a difficult relationship between my co-founder and myself. We had very different characters and different skill sets, and those differences worked very well at the beginning. However, as the business was getting traction and profitable, then those differences started acting negatively. Ironically enough, in addition to ourselves, the 2 big shareholders were also in a difficult relationship. I was thinking what kind of solution might be possible…. And my conclusion was to step back from Representative Directors, where we both were appointed. And ask the other person to replace our roles. Actually, we both stepped back from the position. Of course, I had understood my responsibility as a founder to the new CEO, but I could not keep my motivation to run the company. That’s why I resigned as a director and became an advisor. After my resignation, we were still preparing for the IPO and we might be able to do IPO. However, even if we could go public, the market cap seemed not very attractive and we could easily imagine how difficult our situation is going to be. Simply less attractive than Macromill. That’s why we finally gave up the IPO. Since Interscope had lots of innovative research & analytical technologies, and we were evaluated and supported by lots of clients, Yahoo! Japan thought if Infoplant and Interscope were merged, the merged company would be competitive to Macromill. Infoplant was sold to Yahoo! Japan a year and a half before our deal. And They were competing with Macromill, but could not catch up with Macromill. That’s the reason why Yahoo! Japan was interested to acquire Interscope and actually they did it. And then, the merged company became Yahoo! Value Insight. *The 3 major players have been merged as Macromill. 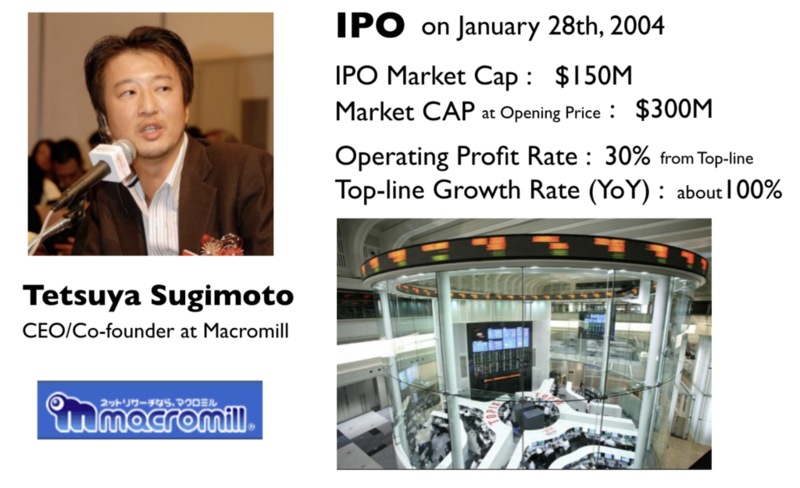 Sugimoto-san, the CEO and co-founder of Macromill, very clever and strategic guy, after several years he made the transfer from Mothers to the 1st sector of TSE, he resigned from the CEO. A few years after he left Macromill, the financial crisis so-called “Lehman Shock” happened. Then the market cap of Macromill dropped off to about 150M from its peak of 600M. Meaning, his asset as the shares of Macromill was also decreased. So he came back on the board and became the CEO again. When he came back on business, the Internet Research market was getting saturated and no more organic growth was expected. The BIG strategy he decided was to merge Macromill and Yahoo! Value Insight, which was the company Infoplant & Interscope were merged. It means all the top 3 Internet Research startups were merged as a New Macromill and have become a Giant in the sector. Hope you like this story. Before I finish my talk, I’d like to talk about “a small story” related to the exit of Interscope. After the press release of the M&A deal by Yahoo! Japan was delivered, I received lots of “two different kinds” of messages from my friends and acquaintances. Do you know which message explained what I feel? Of course, the second one. Finally, let me tell you the “lessons learned” from my own startup. Firstly, to win the competitions. At the beginning of the industry, if you are advanced with technologies, that makes you competitive. However, when the market is taking off, then how to control the market, I’d say your “sales power” gives you a power to lead the game. As the battle of Macintosh v.s. Windows proved. Secondly, the characters of founders define what you can’t do, not what you can do. Because making innovation is extremely hard and you can’t keep your motivation as long as you are doing what you like when you face to difficulties. I think even though it’s not a scalable business, but if you really like it, you should stick with it. Lastly, when you think if it’s time to exit or not, you should remember what was the purpose of your startup? I wanted to get out of my life always worried about money…I wanted to be free from money. I was lucky enough, I did it. But, I made a mistake and I screwed up my next startup. If you’re interested in my failure, I’ll talk about it tomorrow. My first visit to India has become an unforgettable moment. 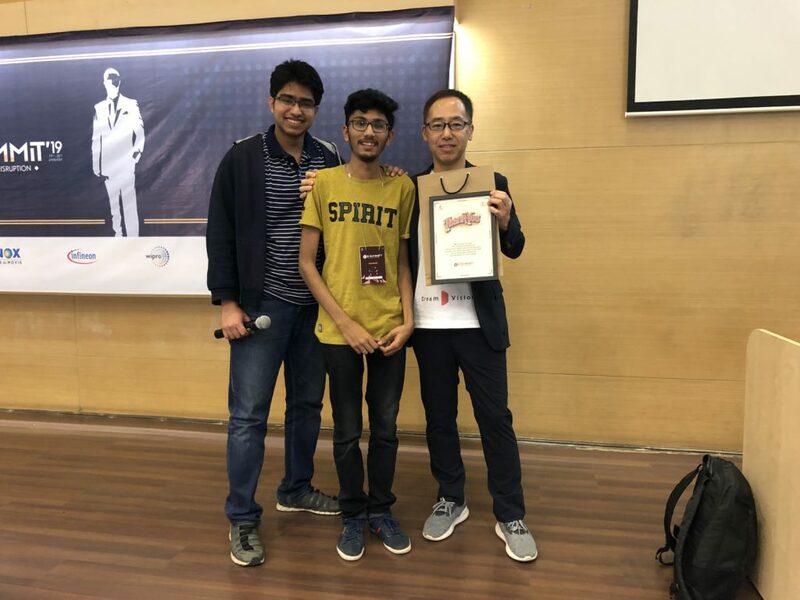 It was my honor to be invited to speak at “E-Summit’19” organized by Indian Institute of Technology Bombay Campus. And also, I was given two different topics for my talk. If it was a business presentation, I’m used to it. However, what I was asked to speak is “narratives” based on my entrepreneur life. Themes given to me were “When to exit” and “Why startup?”. So I was very nervous. However, when I visited the campus to check the venue of my speech and look around, because of the atmosphere, I felt so relaxing. The campus looks like the one of UC Berkeley. My first session was about “When to exit”. Internet Research I talked about Macromill, Infoplant, and the locus of the Interscope launched as a co-founder, EXIT (making Interscope a subsidiary of Yahoo! Japan), which was said to be the three-pronged Internet Research. 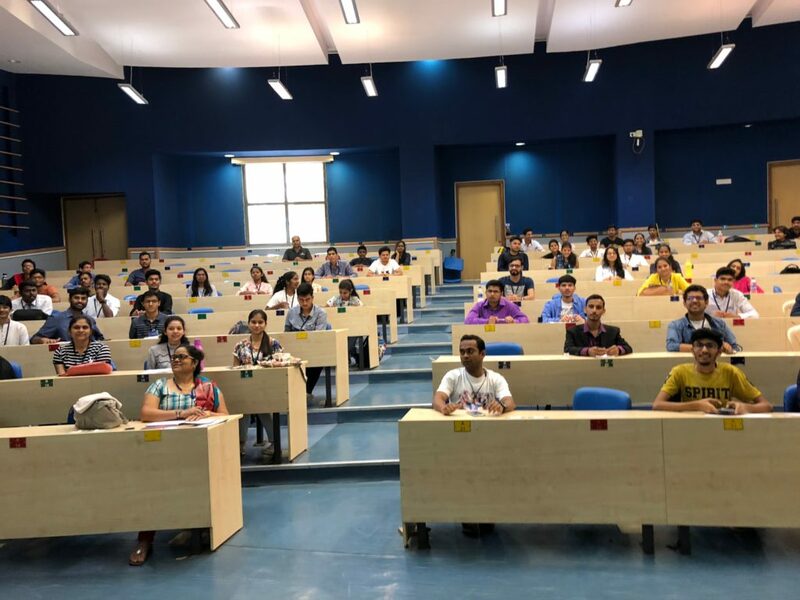 How many students come to listen to my entirely unnamed session in India? Honestly, I was anxious, but about 2/3 people from the venue with a capacity of 250 people participated. “When to exit” was constructed as “narrative”, but its content was tailored as an objective story through the “filter of me” in the characteristics and business strategies of the three companies. Another session, “Why startup?” is a subheading titled “Dare to fail. Stand up stronger.” which I got from Takeda-san who lives in Berlin as English translation title of my book, and my personal I made it a story. Because of that, so many students came to listen to my story than the 1st session. As I introduced it in my story, I was a boy who had a dream to be a musician, technically a guitarist even though I did not have a piece of talent. 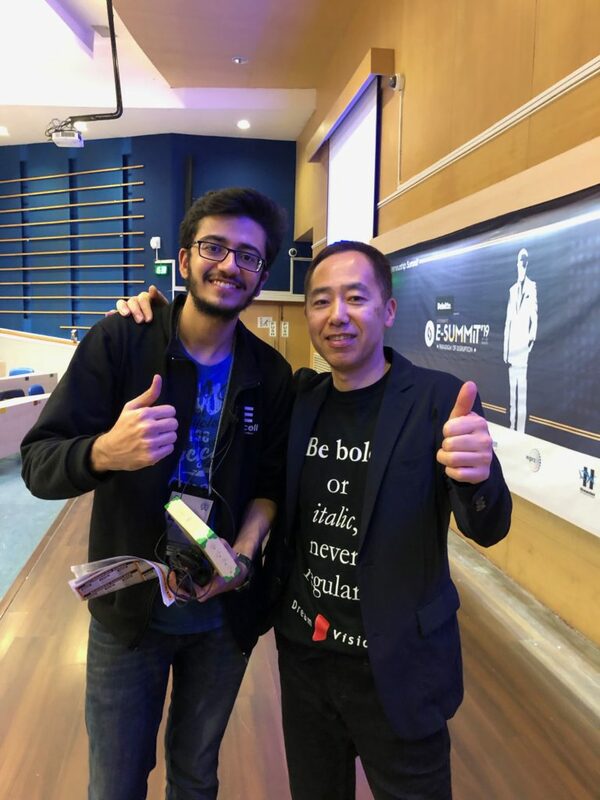 So although this was not by a piece of music, if students could feel and grab something from my talk, it is my pleasure cannot be expressed by any words. I was bashful that some students showed their notes and asked me to sign on the memo they took from my talk. Also, after my talk, when I was walking in the corridor, I heard the word “Why startup?”. Looking at those students, they were talking about my talk looking at the leaflet. *He is the student sent me an email. 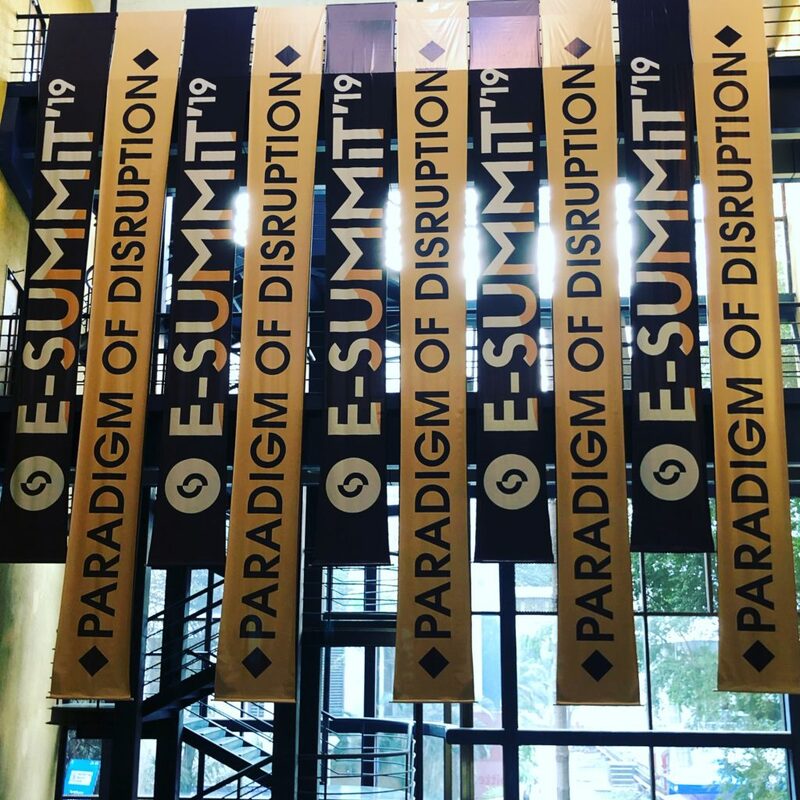 Vedarth Choksi, Head of Marketing at E-Summit’19. He literally changed my life. Last summer, I received one email from Indian Institute of Technology, Bombay, but I had no idea why such email reached out to me. I just wondered if it might be a new kind of fraud or something. 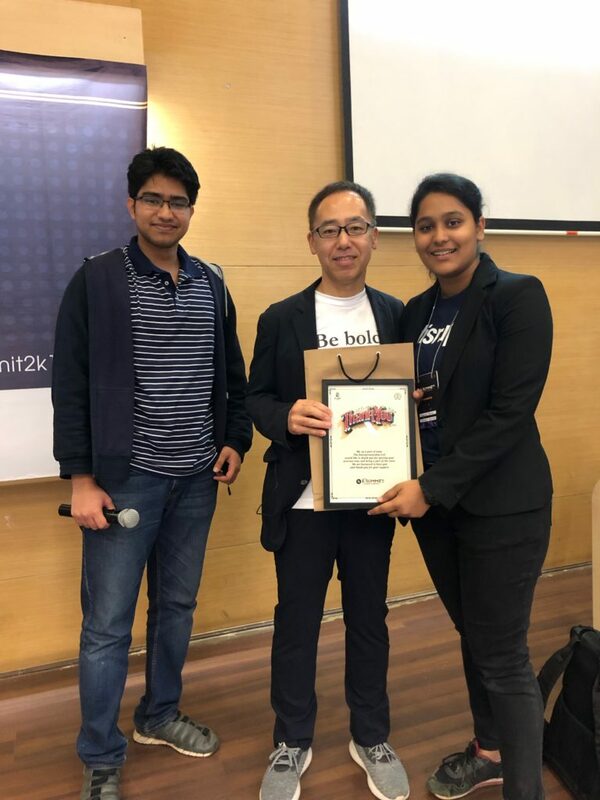 So I forwarded the email to Ebihara-san, who is running a VC in Singapore and India if it’s OK to reply. He forwarded it to his colleague in India. And the reply from his colleague was that E-Summit is a huge and a famous summit organized by IIT Bombay. 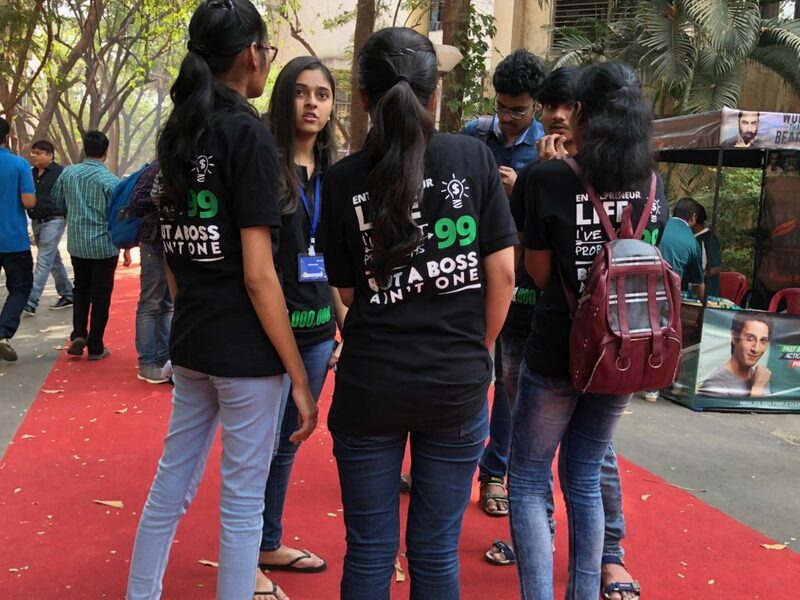 E-Summit seems to be operated by “students” from IIT Bombay. 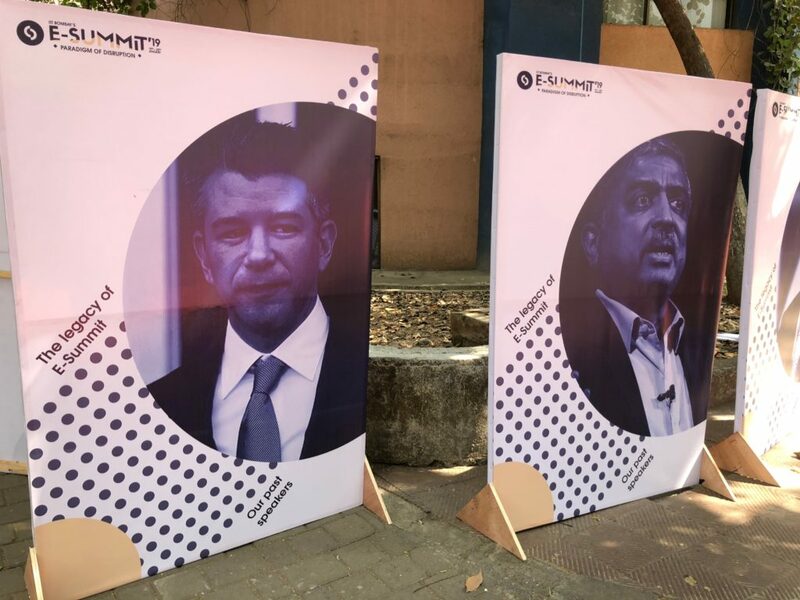 And the person, head of “marketing” seemed to look for speakers who would deliver interesting stories in terms of “Innovation & Entrepreneurship” in addition to “Big Names”. The head of marketing, Vedarth Choksi search and understood my talks and articles in English very well. So, I prepared my talks of “two topics” given by the staff of the summit very well, and I made practices for a change. Just two days before the departure for my first India, I thought visiting India might need a VISA and checked on the website of Indian Embassy in Japan. And then, I realized, yes, I needed VISA! I’m sure it is not be the first and last. I’m sure I’ll be back in India! At a guest house of IIT Bombay, January 20th, 2019 (Mumbai used to be called Bombay). *Added some sentences after I’m back in Tokyo. *Staffs at my second talk, “Why startup?”.